Building electronics is part of the large DIY (Do It Yourself) or Maker movement that has been steadily growing over the past few years. Sites like Pinterest are full of DIY ideas, while others like Etsy provide DIY-ers an opportunity to sell their creations. Not to mention TV shows like Hack My Life, and a full-blown DIY Network, and it's easy to see just how popular the craze has become. Why such traction? Because DIY is fun, with the things you'll create sometimes being of superior quality (and more affordable) than what you could ever buy in a store. With DIY, the idea is to simply make something yourself. You don't have to build anything new or complicated; just learn how to make something instead of purchasing it from a store. From doing so, you not only finish your own personal project, but also gain the practical skills that go along with it. 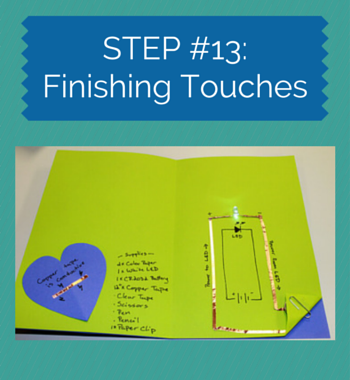 So today, we are going to learn how to make a light-up electronic greeting card. This will be the first in a series of DIY projects I hope to be blogging about in the near future...so be sure to return regularly! 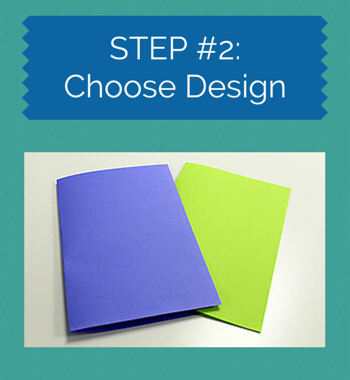 2 x Color Paper: Try to choose two somewhat different shades of color for maximum illumination. 1 x White LED: The light of your electronic greeting card. Available at Frys, Amazon, or other electronics store. 1 x CR2032 Battery: We need to give that LED some life! Available at any local CVS, Target, and most grocery stores. 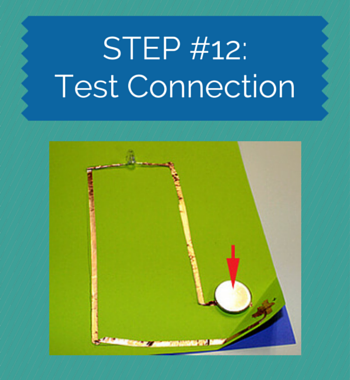 12" Copper Tape: Copper is an important element (no pun intended) because it's conductive. Available at Frys, Amazon, or other electronics store. Download our 2018 brochure to learn more about getting your child started in STEM. Or, continue creating your card with the tips below! Again, when choosing your electronic card design, make sure to choose two contrasting colors to really make sure the light pops when lit. I chose navy blue and iD green! 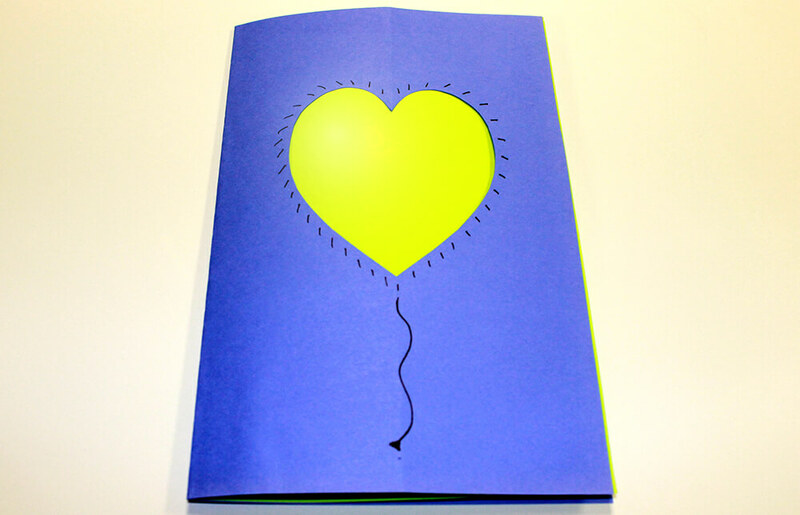 The green paper will be used for the inside since it is more transparent, helping the light to shine brighter. With the navy blue piece, you'll need a window to actually let the light shine through. 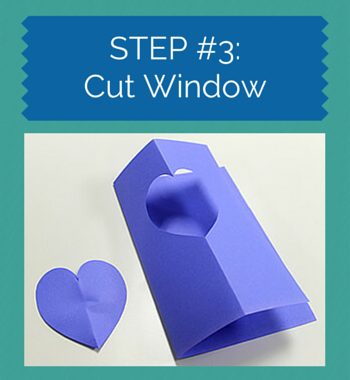 I cut out a heart to make this something of a gift card, but a circle, star, rocket ship, or other fun object will work perfectly, depending on the occasion. 4. Tape your paper together. Now you're ready to tape the two pieces of paper together. 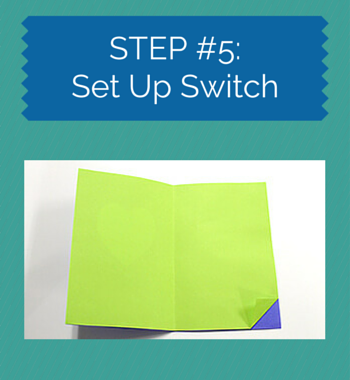 Make sure to use enough tape so the green piece of paper is securely attached to its blue cover. 5. Set up your switch. 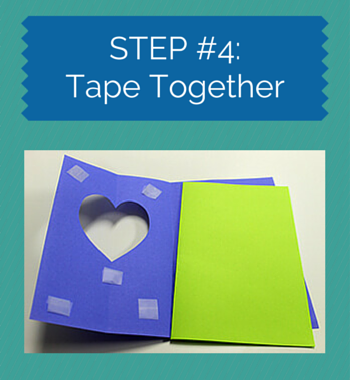 When you tape the green paper to the blue cover, fold the right corner up so it forms a triangle. This will be used later to make your battery holder. You'll want to use a white LED since you're using color paper (if you used white paper, a color LED would be fine). Test the LED to first make sure it isn't burned out! Before moving on, let's talk LEDs. 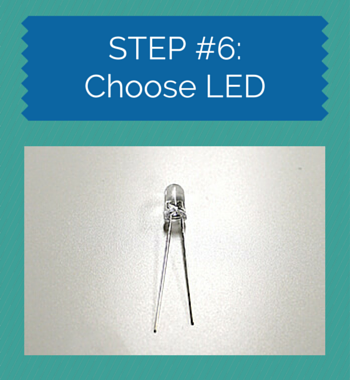 LED stands for "Light Emitting Diode." 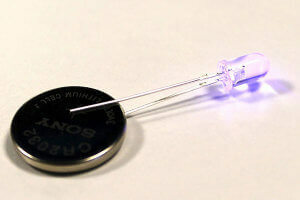 This means that the purpose of this LED is to generate light. 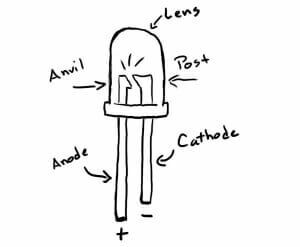 Power goes through the anode ("+" side of the LED) and cycles back to the battery through the cathode ("-" side of the LED) to start the process over again. When the power passes through the anvil to go to the post, light is formed by the released energy. The lens magnifies the light that is generated, which is why a single LED is so bright. 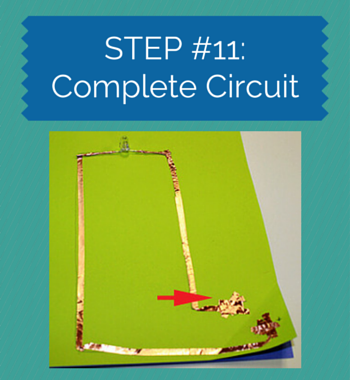 Now, before attaching the LED and battery, you need to plan out the circuit. 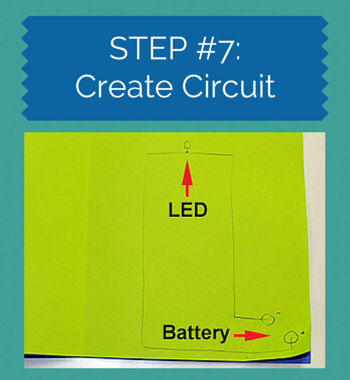 Remember the battery holder you made by folding the paper? Make two circles; one of the top half of the fold, and one for the bottom half. Be sure they match when the bottom half folds up; this is where your battery will go. 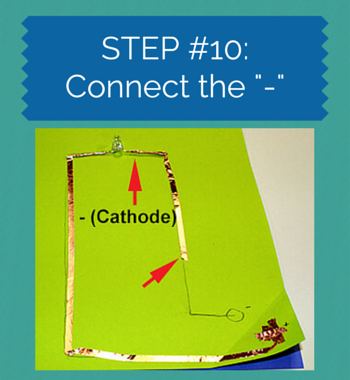 Now, draw the power lines that go from the battery to the LED. The "+" side of the battery will go to the "+" side of the LED. And you guessed it, the "-" side of the led will go to the "-" side of the battery. This completes the circuit. Keep those power lines apart; this is where we will be placing the copper tape. You guessed it...time to tape! Copper is very conductive, which means electricity will flow through it easier than other materials. You need to wrap the tape around the "+" side of the LED so it is evenly covered. The more tape you use, the better the connection. You want to use at least three inches. When you are done, start following the line down to the battery. Have you ever looked at a circuit board and seen the little lines on it? These are called traces. The traces carry the electricity from a power source or microchip to the object it is powering. Think of following the line with your finger. You are tracing it. 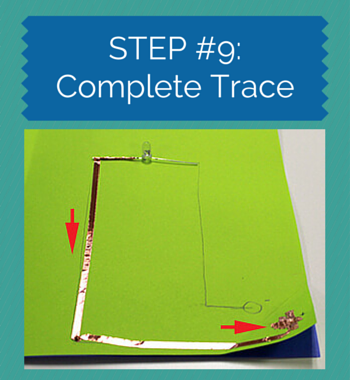 To complete the trace, continue taping along the line to the battery circle you drew. Try to not rip the tape so you have a smooth connection. When you get the battery area, add more tape (these can be ripped off) about a half-inch in size to make sure there is a solid connection when the battery touches it. Now it's time to attach the "-" side of the LED to the "-" side of the battery holder. You will do it the exact same way as the "+" side. Here we ripped the copper tape, but we have an easy fix. Just start a new trace with the copper tape about two inches up from where the tape ripped. This ensures you'll get a more secure connection. 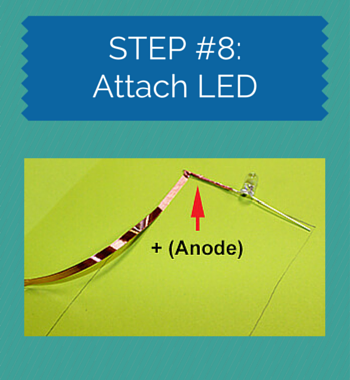 If your LED is wiggling around, use clear tape to hold it in place. Now complete the circuit. 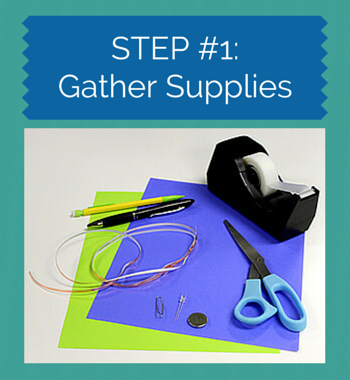 Add extra tape to the "-" circle you drew on the battery holder. If you feel like any of the connections are weak, add more tape. You need to make sure your connections are secure. Place the battery on the card and make sure the "-" side of the battery is facing down (the "+" side says CR2032 on it). Fold over the battery holder and hold it in place with your finger. If everything is set up properly, the LED will light up. If it does not work at first, try moving the battery around to see if it is the connection. You may need to add more tape to the battery holder, but make sure the copper tape sides do not touch each other when the paper is folded. 13. Add your finishing touches. From here, it's up to you to add any decoration you'd like in order to finish the card. I added an electrical schematic with the symbols for battery and LED. You can use the shape you cut out in the card, but just make sure that the area on the left side of the card (where the light will shine through) is left blank...you don't want to block the light after all the work you just did! 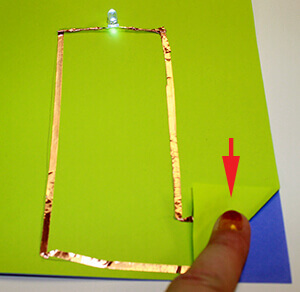 When you are ready to present the card, hold the battery down with a paper clip. You might need to adjust it a few times to secure it. If it is loose, the LED will not light up or blink, which means it is continuously losing the connection. Hey congratulations...you just completed your first electronics project! It's not that hard once you get the hang of it; and like anything, just start small. A different Light up art project. A nightlight (tape LEDs to a bedroom wall). Again, always check with your parents first! Hope you had fun. Stay tuned as every month there will be a new DIY project for you to explore! If you complete this project, we'd love to hear about it in the comments. And if you're looking for another challenge, check out these programming and engineering courses. Good luck!